Reading, writing and arithmetic will always remain key pillars in education, but this next generation is tapping into a whole new way of learning through technology, with students at Suncoast Christian College taking it to dizzying heights with the use of drones and robotics. A cackle of laughter erupts as Jake Gibbons, Talitha Corr, Sofia Dalgliesh and Carter MacDougal whip and flip their drones around the room at a pace; the tiny machines whirring like a swarm of bees with every acceleration. Welcome to the world of contemporary learning, where 3D printers, drones and robotics are as commonplace as a notebook and pen. 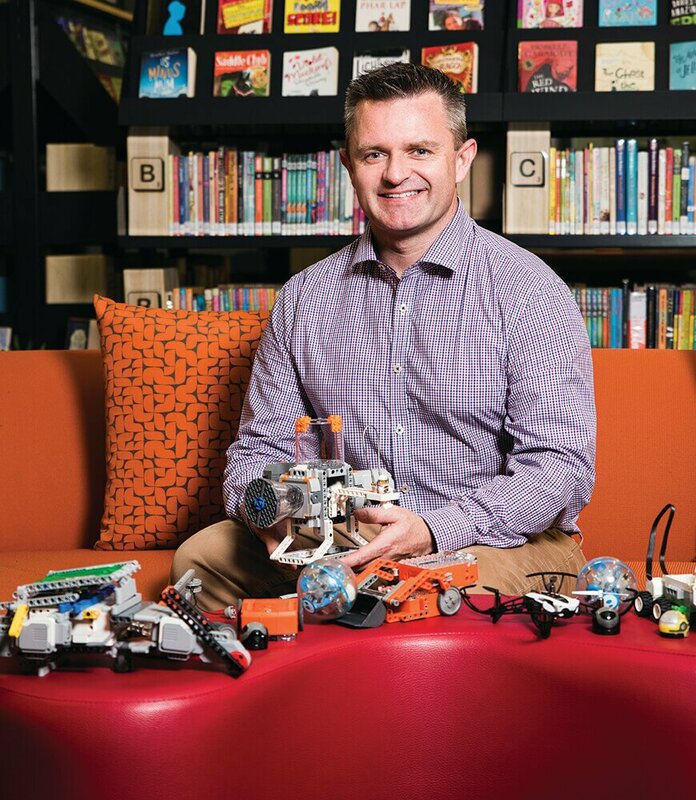 Having started teaching in 1989, Suncoast Christian College principal Greg Mattiske vividly recalls his introduction to technology in the classroom, when he joined Suncoast in 1997. “I remember when I started here at the school, we had one tiny room of desktop computers. I was a bit of an aficionado then, so I would pack up a desktop computer into my car on a Friday afternoon, it was the big CRT monitor not even a flatscreen, and cart it all home so I could keep going with my work on a weekend,” he says. “Then I’d pack it all up and put it in the car with seatbelts everywhere and put it all back before the kids noticed anything on Monday morning. In the staff room, we had two dedicated desktop computers for the staff, and in the library you could book time on ‘the internet computer’ for a 20-minute slot. While Greg rightly points out that a good teacher has always been able to make learning fun, having more tech tools at their disposal now, enables them to engage even more students, particularly as they’re learning in ‘their world’. “Students love technology and it’s very familiar to them; the little Preps come in and you put any sort of device in their hands and they just expect it be to touchscreen and away they go. There’s a preparedness and understanding in kids to work with technologies, so schools must come on board with that,” he says. Touching on creativity expert Ken Robinson’s sentiment, Greg says schools are at risk of preparing students for a world that no longer exists, because our education system was built on a model from the Industrial Revolution. 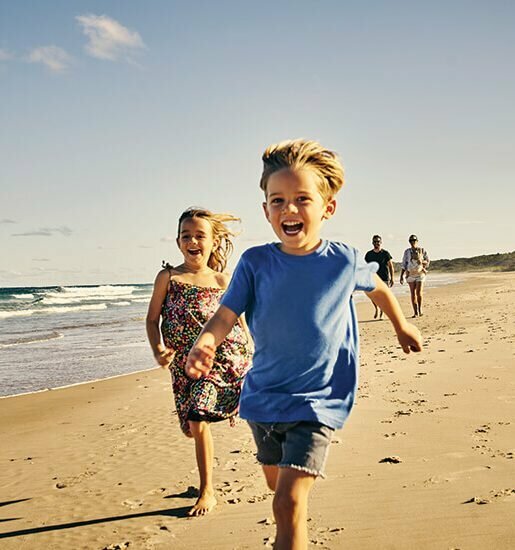 This is why schools such as Suncoast are taking learning into their own hands to make sure their students have every opportunity to be prepared for what lies ahead. “We must do the very best by our students; the future the students are facing is very different from the future into which we graduated; we have to reckon with the realities of the new economy and globalised world,” he says. 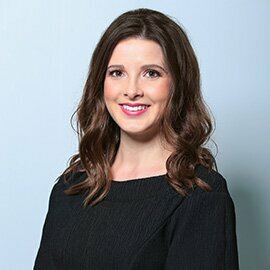 “Employment pathways are not going to be what they were; I’m one of the last generations who trained for a particular job, was employed in that job and have been in the same job since uni. This kind of linear employment pathway will not be the experience for most students. For this reason, Greg says while the three R’s are important, it’s equally important students acquire the ability to learn, get along with people and to collaborate, be creative and solve problems. 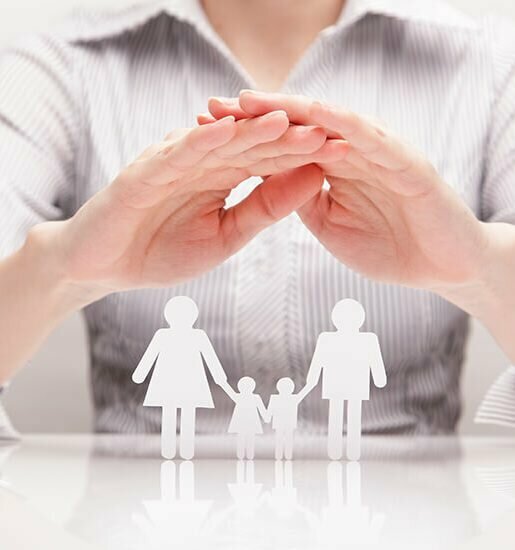 They’ll need to be very resilient – not giving up at the first, second or third hurdles they face. “Lots of schools offer tech but it is the creativity Adam brings to it and his vision for real world applications that sets him apart. There is the buzz and excitement around Adam’s approach, which is linked to real world purposes and to meaningful work, which makes his work extraordinary,” says Greg. Prior to coming to Suncoast, Adam had been teaching for five years when he grew bored, and was coincidentally introduced to interactive whiteboards – exactly what he needed to inspire his teaching practice. With a keen interest in technology, Adam was pivotal in the rollout of the whiteboards and deployment of iPads at the school, providing coaching and mentoring for staff, students and parents who used the new technology. In 2015, when he joined Suncoast, Adam introduced after-school activities, teaching code and scratch programming language. As interest grew, the school recognised that digital technology ought no longer remain an after school activity but was worthy of integrating in the classroom and library. “Books aren’t the only source of information, students are a source of information and we need to tap into each other’s expertise, therefore collaboration is important. The library has been designed with that in mind, to provide spaces for students to interact and share their knowledge and access information in newer and more meaningful ways,” he says, explaining there are also 3D printers available for use, as well as charging stations for students’ mobile devices. Adam says with 43 per cent of jobs likely to cease to exist in the near future, schools have a responsibility to provide opportunities for students to learn new skills and prepare them for the workforce of the future. Drones and robotics have become two of Suncoast’s most exciting additions, with students using them to complete projects similar to what you would see in other schools, but they’ve been taken to new heights. For example, Grade 6 students are learning about space and have designed space rockets to attach to their drones and fly ‘through the universe’, coding the drones to follow a journey through space, which the students have mapped out by calculating distances, measurements and angles. Remember making board games in Grade 3? Well Suncoast students are learning how to make their pieces move electronically, and Grade 5 students are designing theme parks with working rollercoasters, bringing their projects to life. “They’re interested, they’re curious and we need to provide the opportunities for them to explore what they’re interested in and what they’re wanting to learn,” says Adam. There are also some other interesting projects in the pipeline, including having Grade 6 students visit Suncoast dance classes to learn their choreography and replicate it using Lego robots, and in Term 4 this year, residents from a local nursing home will visit the college and pair with students to use Google Earth Pro and explore where they once lived, with the students showing them how these communities have changed and the elderly sharing some interesting stories about their upbringings – bridging a generational gap. 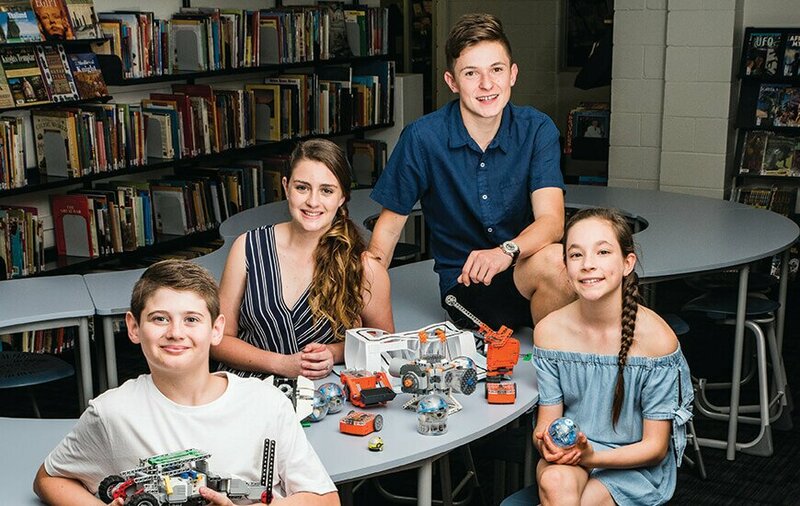 “Adam is doing some of the most extraordinary work I’ve seen in any school for a long time, the way he’s able to integrate technologies into unimagined contexts and learning opportunities; every week he comes up with amazing experiences for the kids to be involved in,” says Greg. “As I said earlier, coding is such a minor element and some schools can get so focused on that, but it’s such a small percentage of the curriculum. I think creativity is key, we want students to be creative thinkers, to be problem solvers, to think about strategy. It’s taking it to the next level every time, not just here or there, every time robotics has to be interesting,” adds Adam. 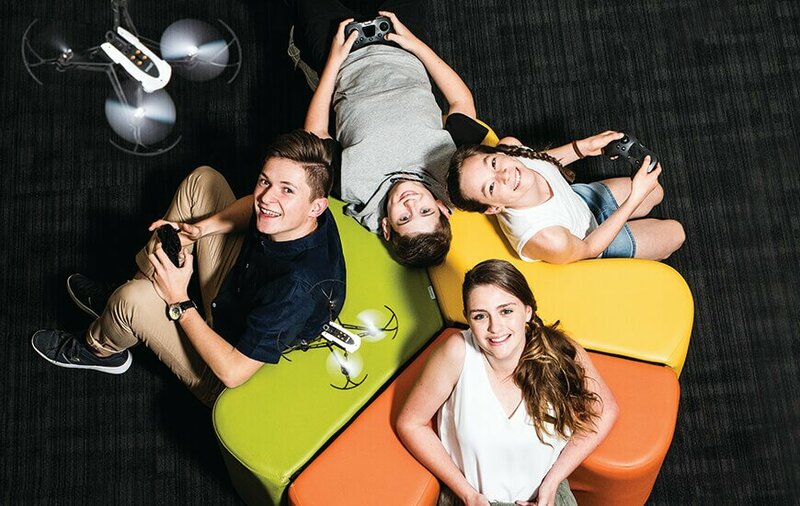 The four students on our cover this month, Jake, Talitha, Sofia and Carter certainly find this new tech interesting and exciting, and are all wanting to use it to maximise their learning in a different way. Jake, who’s in Grade 11, has been into robotics since Year 8 and believes it’s the future. For this reason, he plans to attend university to study mechatronic engineering, aka robotics, and ultimately go on to teach others. 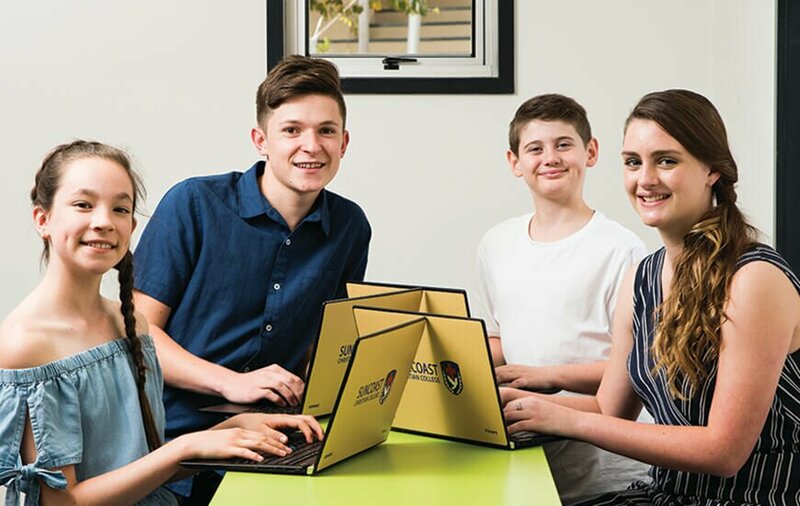 Currently completing a traineeship in IT, Jake is also one of a group of Suncoast students competing on a national level in the realm of Lego robotics. Considering himself more of a ‘builder’, Jake is in the process of prototyping wheel mounts for their robots, using 3D CAD design and 3D printers. “Everything is evolving so quickly, that’s why I want to go into a career that’s always changing,” he says. Talitha, also in Grade 11, has been at Suncoast since Prep, and is covering all bases across her subjects but has a particular interest in IT and graphic design. “I like it because it makes sense to me, I can easily do it whereas some people find it really difficult. I have helped my dad with his resume and I find it so easy,” she says. Grade 6 student, Sofia, is in the Grade 5/6 composite class and helped design the collaborative classroom last year. “We got to think about what ways would we like to learn and got to vote on what we wanted,” she says. “We’ve taken on board the different ways people learn, whether they’re standing up or sitting down, or on the floor, we have every possible thing; stand up tables, couches and lap desks, so you can sit on the floor or beanbags. All of these really cool things put us in this awesome environment – I love the whiteboard tables because I get all of my ideas out! 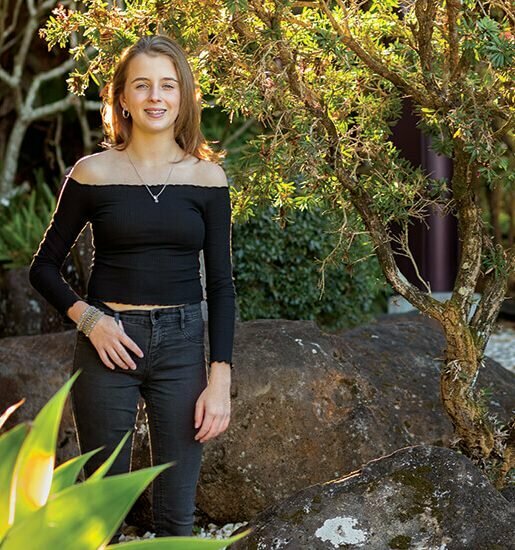 “It makes me feel more connected with the teacher, I’m not afraid to ask for help and she really cares about my learning,” she says. Sofia says she loves seeing the change in ‘then and now’ photos and can imagine what Suncoast used to look like and how it will transform as this new learning style is rolled out across campus in the coming years. “I’ve always loved to learn new things and now I feel more encouraged to learn,” she says. Sofia also shares that she likes to invent things, so is contemplating a career where she can be inventive and creative. In the meantime, she’s enjoying coding her robots to dance to Silentó’s Watch Me (Whip/Nae Nae). Carter, also in Grade 6, is a science and technology buff, particularly drawn to the Lego robotics. “I always had an enjoyment for building things, and being able to code them is that bit better because you can make the robots do what you want,” he says with a smile. Like Jake, Carter aspires to get into engineering and robotics, having been introduced to the technology in Grade 3 and been obsessed with it since. “Some of it is easy and some of it is harder, but that’s the bit I enjoy, pursuing my goal because the more you know the more you can do,” he says. With innovative technologies at their fingertips, the students at Suncoast Christian College really can build the future of their dreams – who knows, even the most outlandish ideas may come true. Cover image: Talitha wears Just Jeans top $49.95 and skirt $59.95; Sofia wears Just Jeans top $29.95 and skirt $49.95; Carter wears Just Jeans top $34.95 and pants $49.95; Jake wears Just Jeans shirt $59.95 and pants $79.95. All available from Just Jeans at Kawana Shoppingworld.